Mins Hair Salon has been focused for foreigners interest since year 2000! please feel free to contact following nearby your location phone numbers for your best hair style. 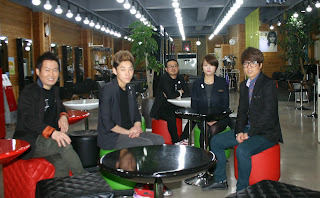 Min In Sook is a manager and owner of Mins Hair Salon in Bundang and Suhe branches. Bundang branch was newly opened in September last year and Suhe branch was started in 14 years ago. In Bundang branch, the Salon has café inside the shop for customer convenience, and along with bookshelves, they also asked their customer to read a book to enhance thinking ability. Approximately 40-50 customers in weekdays and 70-80 customers in weekends were visited in their Mins Hair salon. Most of their customers are age between 40 and 50. At the moment, popular hair colors are maple color for old people and whity ash color for young people. Hair style and design is varying for different new trends and colors depend on individual head and face, no limited. Since 1988, Min In Sook started joining in beauty salon field without any talent and no aptitude, by the times go on though experience and endurance, she was able to get skill and master in beauty salon professional work. She has 23 staff members in two branches, including 3 managers, 7 or 8 designers, other assistances and intern staffs. Most of the staffs’ ages are between 20 and 30. At Mins Hair Salon, it required 4-5 years experience to become a junior designer and approximately 15 years required for a senior designer. Once become a senior designer, he/she can able to handle all kinds of skills of hair salon. Assistance has to do minor hair cutting and washing hair with shampoo or so on, mostly learning by experience. At-least, they have to present 150 hours a year at hair salon. The staffs are occasionally having training program for communication skill and how to receipt the customer. And they have to read a book per month, to get knowledge and idea, and learn communication method from the book. Usually, they have learned English speaking course 2 hours a month and no limited learning in private time. Min In Sook also has a few foreign customers, approximately 40/50 customers a month. She expressed she will like to warmly welcome foreign customers at her hair salon with optimistic service to all, and try to get a better service with a new idea and excellent skill from the staff. They are there for customer’s satisfaction and make a good psychological atmosphere and friendship, as a kind of spreading K-beauty around the world. 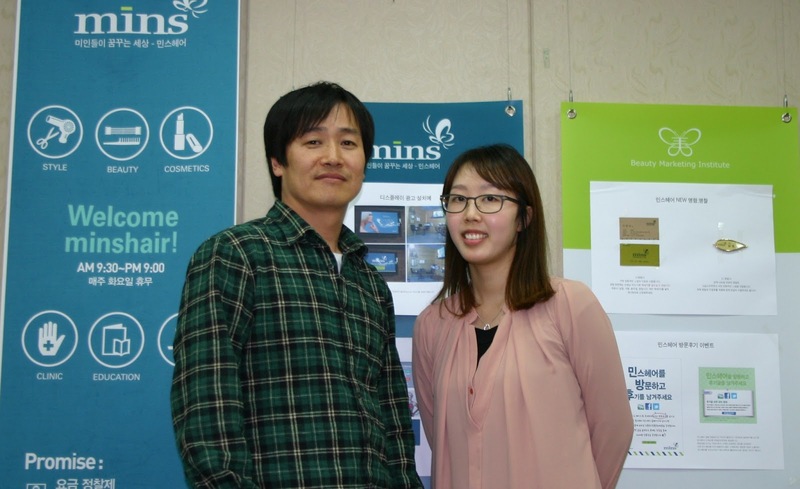 Min In Sook is a PhD candidate with major in Hair and Beauty at Seokyung University. She graduated from the same university with the same major in MA and BA. Her husband is Mr. Landy Park. Mr. Lee Heesun is the owner of Mins Hair Salon, Yeoju branch and chairman of all Mins Hair Salons. Across Korea peninsula there are a total of 26 salons. Mr. Lee started styling hair during his military service at the age of 23, although he wanted to become architecture his hand were good with hair. Mins means the dreaming place for every woman to have a good hair style and beauty. Human life is fluctuation and complex, Mr. Lee explained, but once you come to Mins Hair Salon, all of your troubles will disappear. Mins Hair Salon is different from other hair salons, especially in human resource. Employees have to practice high good spirit such as staff attitude. Human capacity and strength is also important. Mr. Lee believes our heart, feeling and emotions are very important. He likes teaching philosophy and freedom ideas. He likes variety of thinking, arguing and debating on work issue. Korean culture has very little or prohibited for free talking, however His staff members are trained to persuade customers, show respect and also respect among staffs. His employees read books. He wants his employees to develop creativeness. 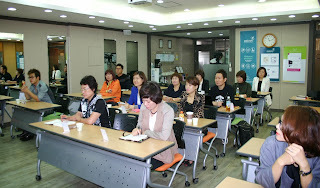 The staffs from every branch rely on both online and offline education methods in Yeoju branch. Since Mins Hair Salon is one of the most expensive in Yeoju area. Mins Hair Salon volunteer to cut senior citizens hair and for poor people “Yeokwang Won”, by taking just one third of price of haircut, and he personally invites foreign customers at his home and have food and talk as friends to have harmony. Mins Hair Salon is popular in hair color treatment and its trend, 2 to 3 tons of colors, his staff is professional and they can figure out the best fit for customer according customers features such as skin color, hair color, bone structure and many other. Mins Hair Salon is also popular in disconnection hair style and symmetrically various designs, this styles also depend on physical features. His salon also has service for African hair. 3 years ago he was introduced to handling African hair and since then he has been developing his skills and tools. His dream is to globalize it. Mr. Lee’s future plan for his salon depends on the condition of his existing salons. Only after his existing salons are strong enough, in term of human capacity, will he extend a new salon. He wants intimate environment for his salon so he wants to make sure he gives that for every branch. He emphasizes on reading a book, which can bring knowledge and improve technique. In fact, he is familiar with the President Park’s book for longtime. Mr. Lee met his wife who is also the vice president at hair salon. Now both of them are pursuing a PhD in art and design subject. They have a daughter who is in 1st year middle school and a son at 5th elementary school. The Global Digest Asst. Editor Blain Bekele edited to this story. Global Digest was invited to interview with Beauty Marketing Institute’s President Landy Park at his office in Seoul. 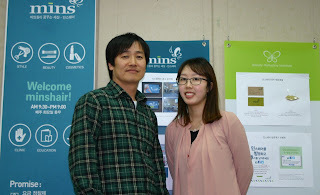 Mr. Park said he started Beauty Marketing Institute (BMI) in 2002 at Bundang, Seongnam city, Kyeonggido Province. He started BMI through connection of his wife and her sister has hair salon business. Meanwhile, Mr. Park feels he wants to have his own independent business and to become a president so he started BMI. Before, he used to work at Samsung Marketing department in Jeilchaeldong group. Right now, BMI has 22 member branchs hair salons and hundreds of Customer Relative Membership (CRM) across the country. Under BMI, it has Venuseum Beauty Academy which focusing on education and training, management and art, so on. The unique of BMI is quality, beauty of art skill, cleanliness, a good service with reasonable price, it uses to charge per hair cut around 20000 KRW. Because its member had gone a hard training to achieve BMI’s goal for quality and customer satisfaction. Another, under BMI is Mins hair salon which provides services. At the moment, Mins hair salon staff members are under training of English language in order to improve communication with foreign customer, client, and guest. So Mins always welcomes you to visit at their hair salon for a better quality and service. Actually, on September 26, 2013, Mr. Park has a small ceremonial on his book. The title of his book is called “All kinds of business’s techniques are stealing.” The book content is about hair salon management, marketing, human resource management and education, and customer service. Mr. Park said he wrote the book about 90% of his own experience and from consultation experience and used about 10% from reference books. This is his first book publication and edition on August 29, 2013 which has 450 pages and 1000 copies. He already sold out around 500 books with the price of 25,000 KRW. He has planned for publishing more books such topics related to sale promotion, small and medium business program and so on. Mr. Park also expressed he wishes to extend his business to oversea. He wants to be a global number one beauty hair salon system, at least, to reach one third of the world’s population. Up to now, Mr. Park has 80% shareholder at BMI company, as a CEO. Mr. Park graduated with MBA from Ajou University in 2008 and BSc Physic from Sangji University in 1994, respectively. His hometown is Bundang, Kyeonggi Province. He is living with his wife and two children, a daughter and son, 17 and 15 respectively. Both children are studying in USA. Manager warmly invited all of customers to drop by their Minshair salon or at their institute for fulfilling yours dream beauty.